This is your yearly reminder about the important February 1st deadline to prepare, certify and post your OSHA 300A Annual Summary of workplace injuries and illnesses, for all U.S. employers, except those with ten or fewer employees or those whose NAICS code is in the set of low-hazard industries exempt from OSHA’s injury and illness recordkeeping requirements, such as dental offices, advertising services, and car dealers (see the exempted industries at Appendix A to Subpart B of Part 1904). This February 1st requirement to prepare, certify and post 300A forms should not be confused with OSHA’s new-ish Electronic Recordkeeping Rule. The February 1st deadline is only about the internal hard copy posting of 300A data for your employees’ eyes. The E-Recordkeeping Rule, on the other hand, requires certain employers to electronically submit data from their 300A Annual Summary forms to OSHA through OSHA’s web portal – the Injury Tracking Application. The deadline for those submissions this year (i.e., to submit 300A data from 2018) is March 2, 2019. Certify the accuracy of the 300 Log and the 300A Summary Form. The Form 300A is a summation of the workplace injuries and illnesses recorded on the OSHA 300 Log during the previous calendar year, as well as the total hours worked that year by all employees covered by the particular OSHA 300 Log. This is your annual reminder about the important annual February 1st deadline to prepare, certify and post your OSHA 300A Annual Summary of workplace injuries and illnesses, for all U.S. employers, except those with ten or fewer employees or those whose NAICS code is for the set of low hazard industries exempted from OSHA’s injury and illness recordkeeping requirements, such as dental offices, advertising services, and car dealers (see the exempted industries at Appendix A to Subpart B of Part 1904). This February 1 requirement to prepare, certify and post 300A forms should not be confused with OSHA’s new Electronic Recordkeeping Rule. The February 1st deadline is only about the internal posting of 300A data for your employees’ eyes. The E-Recordkeeping Rule, on the other hand, is a new requirement for certain employers to electronically submit data from their 300A Annual Summary forms to OSHA through a web portal. Depending on how OSHA resolves an internal policy debate and the outcome of legal challenges from labor groups, that data may also be shared publicly. OSHA has once again delayed enforcement of the controversial anti-retaliation provisions of its new electronic injury and illness recordkeeping rule. OSHA issued its second delay of the effective date of enforcement of this portion of the rule at the request of Judge Sam Lindsay of the U.S. District Court for the Northern District of Texas. Judge Lindsay is presiding over a legal challenge to this portion of the rule filed by industry plaintiffs, and asked OSHA to delay enforcement of the anti-retaliation provisions to give the court additional time to consider a pending motion for preliminary injunction to indefinitely delay enforcement. The new enforcement delay runs through December 1, 2016. As we have described in previous articles, OSHA included in the new electronic recordkeeping rule, a set of new obligations requiring employers to implement “reasonable reporting” procedures for employees to report to their employers work-related injuries. Also included are a broad and vague new set of provisions that expand OSHA’s enforcement authority to prevent employer retaliation against employees who report injuries and illnesses. OSHA has provided little guidance on precisely what the agency intends by “reasonable” reporting procedures or what types of policies may violate the new anti-retaliation provisions, but we understand from past policy statements and regulatory history that OSHA will at least focus on reporting deadlines, safety incentive programs, post-injury drug testing, and management compensation or bonuses tied to injury rates. OSHA’s recent Injury and Illness Recordkeeping reform has created quite a stir for employers. As we discussed in an earlier article about the new Recordkeeping rule, OSHA now requires employers to electronically submit to OSHA their injury and illness recordkeeping data. OSHA will, in turn, publish the data online for all the world to dissect. It turns out, however, the electronic recordkeeping data submission elements of the new rule may not be the most problematic for employers. The new Recordkeeping rule also increases employers’ obligations to implement “reasonable reporting” procedures for employees to report to their employers the work related injuries they incur, and expands OSHA’s enforcement authority by introducing a vague new set of anti-retaliation provisions. To date, employers have seen little guidance about what OSHA means by reasonable reporting procedures or what types of policies may violate the new anti-retaliation provisions. Particularly controversial is the impact of OSHA’s new rule on employers’ policies for post-injury drug testing, safety incentive programs, and executive compensation and bonuses. Although none of those words appear in the amended Recordkeeping regulation, OSHA addressed each in the Preamble to the Final Rule. These topics have been on OSHA’s radar for nearly a decade, dating back to a 2008 Report issued by the House of Representative Committee on Education and Labor entitled “Hidden Tragedy: Underreporting of Workplace Injuries and Illnesses.” From that time, OSHA has been making efforts to address a perceived culture of underreporting injuries and retaliation against employees who do report workplace injuries and illnesses. OSHA has used every tool at its disposal to chip away at employer policies and practices that purportedly discriminate against employees who report injuries, or that attempt to deter employees from reporting injuries in the first place. 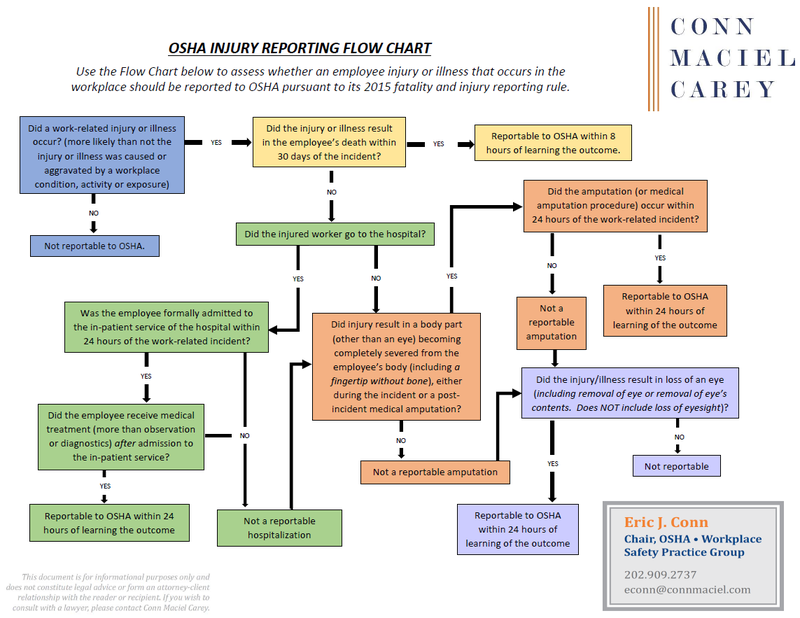 On June 7, 2016, Eric J. Conn and Amanda Strainis-Walker of Conn Maciel Carey’s national OSHA Practice presented a webinar regarding OSHA’s New Injury Recordkeeping Data Electronic Submission Rule as part of the Firm’s 2016 OSHA Webinar Series. As the clock winds down on the Obama Administration, OSHA has been rushing out a series of proposed amendments to its Injury & Illness Recordkeeping regulations (29 C.F.R. Part 1904). Among them is a new final rule to “Improve Tracking of Workplace Injuries and Illnesses,” which will require hundreds of thousands of employers to electronically submit their injury and illness logs (and in many instances, their detailed incident reports also) each year. More importantly, for no apparent safety reason, OSHA intends to publish employers’ injury data and incident reports online. FAQ about OSHA’s Electronic Recordkeeping Rule: Establishment vs. Company-wide? The one question I have been asked more than any other about OSHA’s new final rule for injury and illness recordkeeping electronic submission (aka the “Improve Tracking of Workplace Injuries and Illnesses” Rule), is whether the threshold numbers of employees that trigger data submission requirements apply corporate-wide or by individual establishment within the company. The new recordkeeping rule requires establishments with 250 or more employees to submit to OSHA annually their OSHA 300 Logs, 301 Incident Reports, and 300A Annual Summaries, and requires establishments with 20-249 employees in certain so-called “high hazard industries” to submit to OSHA annually the information from their 300A Annual Summaries only. Employee numbers at each individual location, and report the applicable recordkeeping data for only locations where the employee count exceeds 20 or 249? In a May 11, 2016 press release, the Labor Department announced its latest effort to “nudge” employers to operate safer workplaces by way of issuing OSHA’s controversial final rule for injury and illness recordkeeping electronic data submission (aka “Improve Tracking of Workplace Injuries and Illnesses”). The new rule dramatically revises the responsibilities and impacts of OSHA’s long-standing injury and illness recordkeeping program. Historically, unless OSHA opened an enforcement inspection at an employer’s workplace or the Bureau of Labor Statistics requested an employer to participate in its annual injury data survey, employers’ OSHA 300 Logs and related forms remained strictly in-house. Employers kept the data and their OSHA logs in their HR or Safety Department office, posted them internally for employees to view for a couple of months, used the data themselves to make decisions about how to reduce risk of injury and illness in their workplaces, and then stored the records in a cabinet or desk drawer for five years. In a major policy shift, the new rule requires hundreds of thousands of employers to proactively submit these historically private records to OSHA, which in turn will publish the data online for all the world to see. All establishments with 250 or more employees in industries covered by the recordkeeping regulation must submit to OSHA annually their injury and illness data and information from their OSHA 300 Logs, 301 Incident Reports, and 300A Annual Summaries. Earlier this year, we wrote about a very significant rulemaking to amend OSHA’s injury and illness recordkeeping regulations to require employers to proactively submit their injury logs and reports to OSHA on a regular and frequent basis. We understand OSHA is committed to implementing that rule before the Obama Administration shuts out the lights and hands over the keys. The data submission recordkeeping rule is not, however, the only effort underway by OSHA to reform its recordkeeping regulations. In what is certain to land OSHA back in court, OSHA plans to soon roll out a rule that attempts to end-run around the U.S. Court of Appeals for the D.C. Circuit’s decision that rejected the Agency’s historical doctrine that violations of OSHA injury and illness recordkeeping requirements continued each day an employer’s log remained incomplete or inaccurate, and declared instead that recordkeeping violations may only be cited within a strict six month statute of limitations. OSHA has attached the misleading name “Clarification of Employer’s Continuing Obligation to Make and Maintain an Accurate Record of Each Recordable Injury and Illness” to this rulemaking. Not updating prior years’ 300 Logs based on newly discovered information about previously unrecorded injuries or changes to injuries that were previously recorded. Reasonably believe, based on their knowledge of their companies’ recordkeeping processes that the 300A Annual Summary Form is correct and complete. The immediate supervisor of the highest ranking company official working at the establishment. After certifying the 300A, OSHA’s Recordkeeping regulations require employers to post the certified copy of the 300A Summary Form in the location at the workplace where employee notices are usually posted. The 300A must remain posted there for three months, through April 30th. Another common mistake employers make is to not prepare or post a 300A Form in those years during which there were no recordable injuries or illnesses at the establishment. Even when there have been no recordable injuries, OSHA regulations still require employers to complete the 300A form, entering zeroes into each column total, and to post the 300A just the same. Any corresponding 301 Incident Report forms. In this technology era, many employers have transitioned to using electronic systems to prepare and store injury and illness recordkeeping forms. As a result, another common mistake employers make is to keep only the electronic version of the 300A, and not the version that was printed, “certified,” typically by a handwritten signature, and posted at the facility. Accordingly, those employers have no effective way to demonstrate to OSHA during an inspection or enforcement action that the 300A had been certified. Finally, another common mistake employers make is to put away old 300 Logs and never look back, even if new information comes to light about injuries recorded on those logs. However, OSHA’s Recordkeeping regulations require employers during the five year retention period to update OSHA 300 Logs with newly discovered recordable injuries or illnesses, or to correct previously recorded injuries and illnesses to reflect changes that have occurred in the classification or other details. This requirement applies only to the 300 Logs; i.e., technically there is no duty to update 300A Forms or OSHA 301 Incident Reports. As mentioned above, the February 1st deadline is separate and apart from the electronic data submission requirement of OSHA’s new Electronic Recordkeeping Rule. The deadline in 2018 for employers to electronically share data from their 2017 300A forms with OSHA is currently set for July 1, 2018, but the rule itself may change, and so too may that July deadline. OSHA has signaled through status reports in a federal district court proceeding and in its semi-annual regulatory agenda that it is working on a Notice of Proposed Rulemaking to reopen the E-Recordkeeping Rule and change it or rescind it. The most likely changes we predict are limiting the data that will be required to be submitted to only 300A Annual Summary data, rather than the full panoply of recordkeeping data, regardless of the size of the employer, and perhaps some other changes to limit the set of employers covered by the rule. Here are a few articles we have written about OSHA’s E-Recordkeeping Rule. Accordingly, although the web portal is now accepting 2017 data, we encourage employers to wait until close to the July deadline to submit data, because the rule itself may change and the deadline may be pushed to allow more time for OSHA to change the rule. As we wind down the year and head into the waning days of the Obama Administration, we look with interest at the Administration’s latest, and likely final, Semi-Annual Regulatory Agenda, published November 20th. If one were a jaded OSHA defense lawyer like me, the thought that publication of the Agency’s list of regulatory priorities and planned rulemaking activities on the eve of the Thanksgiving holiday, when most of the country is focused on family, preparing a Thanksgiving feast, and gearing up for some good football, might have been intentional. “Maybe they won’t notice?” Well, we did, and we thought it would be useful for our readers to have a summary of OSHA’s final priorities in the regulatory arena as the Obama Administration focuses on legacy, and what they would like to accomplish before Secretary Perez and Assistant Secretary for OSHA David Michaels turn out the lights next year at 200 Constitution Avenue. One note about OSHA’s robust list of planned regulatory activity for 2016 — and an apt idiom for an analysis of the Thanksgiving Regulatory Agenda — OSHA’s eyes are too big for its stomach. While the Agency’s plans look ambitious and aggressive, if history is a guide, the cumbersome rulemaking machinery will prevent much of these plans from coming to fruition, especially in the final few months before the presidential election. Unless 2016 is an exception, this means there really are only a few productive months remaining for OSHA to accomplish some subset of its long list of priority actions. Looking at the roadblocks Dr. Michaels has already faced in the regulatory arena throughout his term – some of which came from the White House itself – it is unlikely OSHA will accomplish much of what appears in its final Regulatory Agenda. Notwithstanding, it is important to understand the Agency’s rulemaking plans for numerous reasons, the most important of which is that you can count on the fact that Dr. Michaels’ last priorities will become the first priorities of the next Administration, should a Democrat again take the White House. The long and short of the new reporting requirement is that an amputation constitutes an automatic report to OSHA even if it does not result in a hospitalization or any days away from work, or even require medical treatment beyond first aid. There are, however, several key nuances that employers must be aware of before they pick up the phone to call OSHA. What Types of Injuries Should be Reported as an Amputation? The rule was widely-criticized by stakeholders through the notice and comment period, but OSHA has advanced the rule to the final stage of the rulemaking process. Specifically, on October 5, 2015, OSHA submitted a draft final rule to the White House’s Office of Information and Regulatory Affairs (OIRA). OIRA is a division of the Office of Management and Budget (OMB) that is responsible to review near final proposed regulations, particularly significant regulatory actions. Generally, OMB has up to 90 days to review a rule, but that period can be extended. This particular proposed rule would require many employers to electronically submit their injury-and-illness logs (and in many instances, their detailed incident reports also) to OSHA on a regular and frequent basis, as often as quarterly for large employers. For no apparent safety reason, OSHA also intends to publish employers’ injury data and incident reports online. This proposal would dramatically shift the current recordkeeping program. Currently, unless OSHA inspects an employer or the Bureau of Labor Statistics (BLS) requests that the employer participate in an annual injury recordkeeping survey, OSHA 300 Logs and related forms remain strictly in-house. Employers keep the data and their OSHA logs in their Human Resources’ or Safety Director’s office, post them for employees for a couple of months, and then store them in a desk drawer for five years. Employers with 20+ workers in certain “high hazard industries” must submit to OSHA their 300A Annual Summary data of recordable injuries on an annual bases. On New Year’s Day 2015, the Occupational Safety and Health Administration’s (OSHA) new injury and fatality reporting rule became effective, significantly revising the triggering events for reporting workplace accidents to OSHA under the Agency’s Injury and Illness Recordkeeping regulations at 29 C.F.R. 1910.104, et seq. Require publication of the reporting events on OSHA’s public website. Requirements of the New Reporting Rule. The reporting rule has been long-referred to informally as the “Fat-Cat” rule because it requires employers to report to OSHA all incidents that result in an employee fatality (Fat) or a catastrophe (Cat). The new regulation redefines catastrophe. Historically, a catastrophe had been defined as an incident that resulted in the overnight hospitalization for treatment of three or more employees. In addition to lowering the threshold from three to one employee hospitalizations, OSHA also changed the definition of “hospitalization.” Historically, an employee’s overnight hospital stay triggered the reporting requirement. Under the new rule, whether the hospitalization is a reportable event turns not on whether the employee stays overnight, but rather, whether the employee is formally admitted to the “in-patient” service of the hospital or clinic. The visit, however, must involve medical care after the in-patient admission. A hospital visit only for observation or diagnostic testing, even if it involves in-patient admission, does not constitute a reportable event.